GALILEO is an app-controlled robotic dock for iPhone (and other devices) bringing a new dimension of motion control to your iPhone. You control the orientation of your iPhone remotely or let galileo rotate your iPhone automatically with new apps constantly being developed (see RecoLive, below), the possibilities are endless. 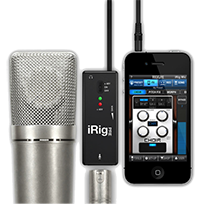 IK MULTIMEDIA, IRIG PRE can used the iRig Pre with iOS and Android smartphones. The iRig Pre will allow use of any professional microphone: use any Dynamic microphone with the pre amp switched on or simply, switch to +48v to add phantom power and use a shotgun microphone too. Plus, IK Multimedia have created an iRig Recorder app for iOS and Android. The iRig Recorder app has eight editing processes which give a great opportunity to edit and trim the file before exporting. Export the finished audio file to Dropbox or simply send to SoundCloud. 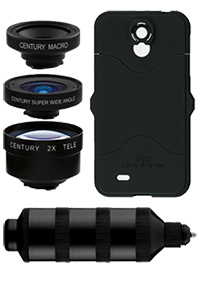 Having used the iPRO LENS SYSTEM for about a year now with iPhone 5's it is a great solution with the lens stored inside the grip handle. When not in use the case is protective and non-obtrusive and has tripod mounts on both sides so isn't one of those cases that you have to remember to put on when you want to use the lens - just leave it on. Perfect for the Galileo is the MULTI-CAMERA SHOOTING APP FROM RECOLIVE. The tutorial on YouTube (click the QR code to view) says it all but essentially a multicamera studio controlled using a tablet or even iPhone as the production switcher. Add multiple camera from iPhones and even use your laptop as another source to cut in slides. 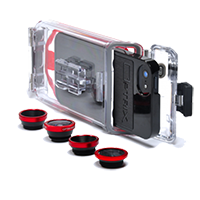 The PHOTOPRO X KIT FROM OPTRIX will give your iPhone a lease of life underwater, in the snow and in other phone unfriendly places. We brought the bike handlebar mount, the vehicle (or other smooth surface) suction sucker, tripod adapter and the wrist float. Lens are simply to screw on and gives great results with a membrane screen for full phone control. The rear clip attachment hasn't let us down but would like to see a double action opener for even more peace of mind that it won't open 3 metres underwater. 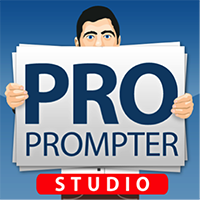 As users of the Portaprompt tablet prompters we use the PROPROMPTER STUDIO APP on a iPad for the studio. With the studio version you get full control (wired or wireless), multiple script loading methods, mirroring and a scroll slider for responsive speed up, slow down and reverse scroll.